The foundations and walls of concrete homes are traditionally constructed by pouring concrete into temporary forms, which are removed when the concrete has dried. Homes built with insulated concrete forms (ICFs) are an alternative to this type of construction. ICFs consist of rigid foam forms that hold the concrete in place when it's poured, and the forms then serve as a permanent, insulating component of the walls throughout the life of the home. Building with ICFs can lead to greater structural strength and improved energy efficiency, but there are disadvantages to consider. ICFs consist of rigid foam forms that hold the concrete in place when it's poured, which insulates the walls throughout the life of the home. 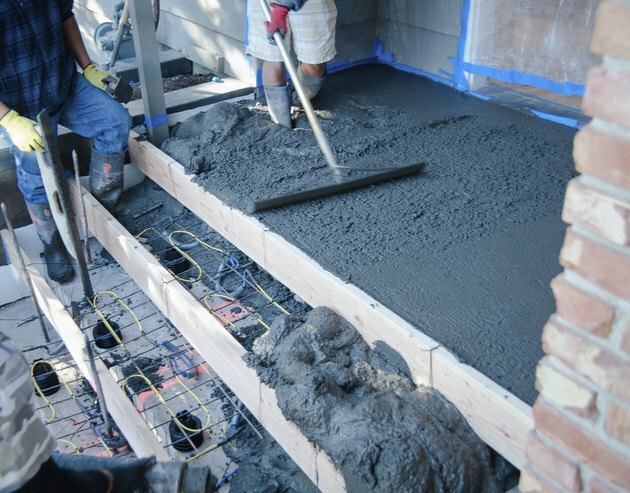 One major disadvantage to insulated concrete forms is the cost. You should expect to pay 5 to 10 percent more in construction costs than you would for a traditional wood-frame house. The exact figure depends on the current price of concrete -- which can fluctuate -- and the design of the home. While an ICF home may lower your energy costs and save you money over the long-term, the initial cost may be prohibitive for some budgets. Another problem with ICF homes is that they are difficult to remodel. You must think carefully about your home's design and anticipate changes that you might want to make in the future. For instance, adding a window or door will require cutting into solid concrete walls, which can be complicated and time-consuming. It is also important to account for all of the electrical and plumbing chases that you require, because adding them after construction may also require cutting into concrete. If you are building a smaller home, you may have an issue with the amount of valuable indoor floor space that must be devoted to the insulated concrete forms. ICF walls consist of several inches of rigid foam insulation and reinforced concrete, which means they take up more space than traditional wood frame walls. If polystyrene forms are used for ICF construction, that exterior foam insulation may actually provide a route for insects and groundwater to enter the walls. To address this problem, you can choose foam blocks that are treated with an insecticide and designed to be waterproof. However, these blocks are usually more costly than untreated options, which may drive construction costs a bit higher. Immediately following construction, an ICF home may experience problems with humidity. The rise in interior humidity occurs because the concrete is still in the process of curing. Once it is fully cured, the air's moisture level should return to normal. In the meantime, you can use an air conditioner or dehumidifier to reduce your home's humidity.